I'm so happy that we've made it to Friday! This has been an exceptionally long work week so I'm looking forward to the weekend. No big plans for the weekend except for the SuperBowl party at my brother's on Sunday. I still haven't decided what to bring but my niece requested "Grandma Little" bars so I think I'll bring an assortment of bars and cookies. Now, on with the card. Today's card was made for my girlfriend who celebrated her 40th birthday yesterday. Her favorite color is purple and she loves to garden so I pulled out Ginger from InStyle Stamps and some Verbena papers from K&Company. I colored Ginger with re-inkers and used my Nestabilities for her and the scalloped mat. Happy Friday everyone. I hope you have a wonderful weekend. Thanks so much for stopping by. 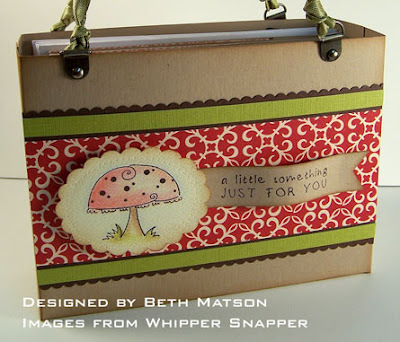 Sorry, no time to chat today but I wanted to post another Whipper Snapper card using the Friendly Expressions set from Anna Wight (SweetMissDaisy). Thanks for stopping by. I hope you all are having a wonderful week! On Monday, a challenge was posted to the InStyle Stamps blog to create a "square coat card." Using the directions on the blog I got to work making my card. For my "coat" and belly band I used a piece of double sided paper from American Crafts. I think it pairs well with the SU River Rock and Baja Breeze so I used those colors for my inner card paired with some Basic Black. The stamp (Marti from InStyle Stamps) is colored with Prismacolor pencils and layered with Nestabilities. I colored the Prima flower with a Copic marker and added some jewels to the center. I did change up my version a little. I created a belly band to hold my card shut instead of attaching the strip to the "coat" and tying it shut with a ribbon like it shows in the directions. Here's a view with the band removed and the "coat" open to reveal the card inside. I really had a lot of fun trying this style of card. I hope you'll join the challenge! A challenge was issued recently on PaperCraftPlanet to create a Valentine tag using Clear and Simple Stamps so I pulled out the Gourmet Darling set because I thought the 'Kiss the Cook' sentiment would be a fun one to use. This Darling is serving up her heart on a platter. I started with a manilla shipping tag and sponged it with Tea Rose Distress Ink. Kiss the Cook was stamped with Archival Jet Black ink and a strip of SU Bella Rosa paper was added. Next I stamped the Gourmet Darling on some patterned paper and added a little coloring to the image with Prisamacolor pencils. I used my Nestabilities for the hearts that are on the serving tray. To finish off the tag I added a variety of ribbons. Thanks so much for stopping by. I hope you're all having a great week! Is there an age limit to monster cards? What if it's for your brother? My brother is in his 40's but I still thought this monster would make a great birthday card for him. I stamped the monster four times and colored them. Then I attached the first one to the card. The second layer is just the body, then for the third layer I cut out the mouth and the fourth layer is just the eyes. I paired the monster with some papers from the Basic Grey Granola collection. Well, we've made it to Friday and I have another card using Anna's (SweetMissDaisy) new Friendly Expressions set from Whipper Snapper. I thought the 'Always' sentiment would be nice for an anniversary card so I stamped the flowers in the set with Old Paper Distress Ink to give it a watermark look and then colored the flowers with Copics. Then I stamped 'Always' with Vintage Photo Distress Ink. I added some brads, a little corner detail and a nice wide ribbon to finish it off. I love all of the different styles of cards you can create with this set and I've had a great time sharing my creations with you. I hope you've enjoyed this week of Whipper Snapper and I will continue to share more of my Whipper Snapper projects with you but I also have some Valentines and Birthday cards to share so next week will be a variety of stamps. I hope you'll keep checking in. For today's card I used the Fish Friends set from Whipper Snapper. I love the cattail stamp in that set and think it's the perfect image for masculine cards. Whipper Snapper Day Three Cont. I am having so much fun with the Whipper Snapper sets that I am going to post twice today. The new sets from Anna (SweetMissDaisy) are so versatile that I find myself turning to them again and again. I really wanted to make a fishy card so I printed up the greeting on my computer to pair with the larger fishy from the Fish Friends set. To make the scallop frame around the fishies I set a circle nestie inside a scallop circle nestie and ran them through my cuttlebug at the same time. The fish are watercolored and mounted with pop dots. I pulled out some Crate Paper for this simple card. The green strip is the reverse side of the floral print. I stitched around the edge and attached to a cream colored base. The 'Thanks for your kindness' stamp is from Anna Wight's new Whipper Snapper Friendly Expressions set. I added a little bit of green to the flourishes with a prismacolor pencil. The saying is cut out with Nesties and mounted with pop dots. I'm having so much fun with Anna's new sets that I plan to post Whipper Snapper creations each day this week. Here is day two with the new Anna Wight Whipper Snapper sets. I hope you're all having a wonderful week. Thanks for stopping! Last month I received an email from Anna Wight (SweetMissDaisy) asking me if I would like to be a Whipper Snapper Featured Designer for January and February and I could hardly contain my excitement. 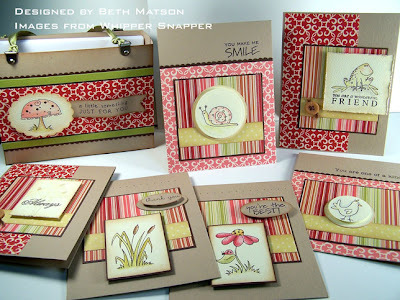 I love the sets that Anna creates for Whipper Snapper so I was thrilled to be able to play with the January sets this past week. The two sets releasing this month are Friendly Expressions and Fish Friends. I love all of the little animals and mushroom in the Fish Friends set and the Friendly Expressions set has a very nice variety of sentiments in fun fonts. Here's my first project with the two new sets. 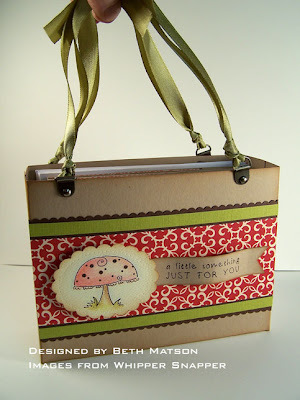 I created a little tote using the pattern from Shannan Tuebner and a set of six cards to put in the tote. Here's a closeup of the front of the tote. And here are the cards in the tote. I will post individual photos of the cards in my Splitcoast gallery later today. Recently I did some cleaning and re-organizing in my craft room and put away all of my holiday stuff so I could move on to Valentines. I pulled out a couple of Hero Arts sets and stamped several images with Archival ink on SU Whisper White and then colored them with prismacolor pencils and gamsol while I watched a movie. Cutting them all out was a little time consuming but I love the effect. I also punched out hearts and covered them with Firebrick Distress Stickles for each of them to hold. The cards are 4 inches square and not too bulky so they will mail well. I'm planning to make enough to send to all my nieces and nephews and my girlfriends children so I stuck with a pretty simple design. This first batch is from the Happy Day Animals clear set. This second batch is from the Playful Animals set. For those of you experiencing this cold spell we're having here in the northern mid-west I hope you're all safe and warm! Thanks so much for stopping. For today's project I used another stamp from InStyle stamps called Sheree. She's so cute lounging in her tub of bubbles. I trimmed her down with my labels 1 set from Spellbinders and used her as the label on a jar of bath salts. For the bubbles I used the melted pearl technique. Use your versamark pen to color them then emboss them with clear embossing powder and while it is still warm brush the bubbles with pearl ex. Reheat them a little so the pearl ex melts into the embossing powder. I didn't get a good photo of them but in person they have a nice irredescent look like real bubbles. I hope you're all having a Happy Monday! Thanks for stopping by. My friend's little girl had a birthday yesterday so I made her a little trinket box. I got the idea from Kimberly Crawford's blog For the Love of Paper. Here's the link to her Fairy Box. For my box I used the largest die from the Spellbinders Label 1 set and cut out two each of chipboard, white cardstock and patterned paper. I covered the chipboard with the white cardstock and patterned paper then created by box. Since the label was about 4 inches square I decided to go with a 3 inch box and make it 2 inches high. I attached the box to the bottom label and then made a 3 1/4 inch box that was only 1/2 inch high to attach to the top label for the lid. The top was decorated with more labels, a G from the Olivia Cuttlebug set and a butterfly from the Martha Stewart punch. and I have another card using InStyle Stamps! But first I would like to wish you all a belated Happy New Year! I took some time off from blogging to spend more time with family over the holidays but I am back now and ready to share more projects with you. Today I'm going to show you Pam and Buster from InStyle Stamps. I paired them with papers from the Sugared line by BasicGrey and Kraft cardstock from InStyle Stamps. I used pink pirouette ribbon from SU and colored the image with SU's watercolor wonder crayons and an aqua brush. I just love this image! Who doesn't love a smiling doggie in a matching sweater.